A yummy take on an old classic. 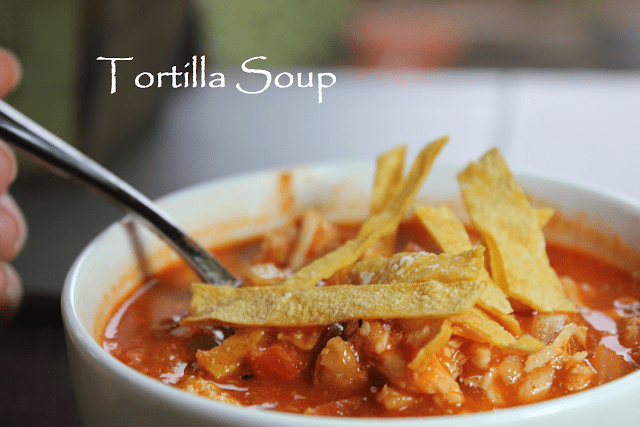 This recipe truly is the BEST tortilla soup you’ll find! I know, I know, there are hundreds of variations of this recipe, all just a little different. But I think what knocks mine out of the park is to saute chopped up tortilla’s with the onion…it gives a depth of flavor that enhances this soup ten fold. Give it a try, let me know what you think! Preheat oven to 375. Bake chicken until fork tender, about 25 minutes. Let cool slightly, shred with a fork and set aside. In a large dutch oven or soup pot, add olive oil, onions, garlic and chopped corn tortillas. Saute until onions are translucent and tortillas are soft. Add jalapeno, salt, cumin, chopped tomatoes and tomato paste. Cook for about 5 minutes until all flavors merry. Add remaining ingredients and heat throughly. Top with your favorite toppings below and serve! cut 3 corn tortilla’s in strips and bake in preheated 400 degree oven for 5-10 minutes or until crisp but not brown.